Make a statement! Order your official T-shirt! Show that you are contributing to a kinder, more inclusive and accepting world. EA’s Play to Give program promoting in-game challenges and donation to charitable partners. Through Play to Give, EA celebrates the importance of inclusion and play and the positive connections it makes for all the diverse players around the world. With millions of hours spent in play every day, games are a powerful platform for creating positive, inclusive connections. You can support the cause too. PACER is pleased to offer a new resource for teachers: “T.E.A.M. Rudolph and the Reindeer Games” (T.E.A.M. stands for Treat Everyone As Members). This free digital teacher toolkit celebrates acceptance and inclusion through teamwork. The toolkit was created in conjunction with the release of a new picture book of the same name by Joe Troiano, who is also the author of Spookley the Square Pumpkin. The book reveals the untold story of how the Reindeer Games became a celebration of acceptance and diversity. Educators can register online to receive the toolkit’s resources, which includes streaming video of the picture book, classroom activities and a discussion guide, and streaming Rudolph music. A portion of the proceeds of the sale of the book will be donated to PACER’s NBPC. For information and to register for the classroom toolkit, visit PACER.org/TeamRudolph. Play ‘Rudolph’s Rooftop Gift-away’ and support PACER’s NBPC! Embrace the holiday spirit by playing the new online game “Rudolph’s Rooftop Gift-away!” The game features more than $16,000 in prizes, including a $500 shopping spree, and supports PACER’s National Bullying Prevention Center. For each gift delivered in the game, $1 will be donated to PACER’s National Bullying Prevention Center (up to $15,000). PACER’s National Bullying Prevention Center has partnered with the I Am A Witness campaign, which aims to stop bullying by activating the “silent majority” of kids who witness it each day. The goal of the campaign is to transform students who witness bullying from passive bystanders into an active collective that speak up against bullying. I Am A Witness has created the Witness Emoji, which is shaped like a speech bubble with an eye in the center. Students can use the emoji to show support for someone who is being bullied by posting it online or through a text message. Teens can post the Witness Emoji when they see hurtful comments, or send GIFs and stickers to show support for someone in need. More than one in four children experience bullying each year, and research has shown that the bystander can play a pivotal role in stopping it. For information, visit iwitnessbullying.org/. The second in a series of blogs about bullying was posted to Babble, A Company of Disney, in honor of the 10th anniversary of National Bullying Prevention Month this October. Be part of the movement to unite against bullying and promote kindness, acceptance, and inclusion among children. Bullying affects everyone involved. Whether the child is the target, a witness, or the person who bullies, the end result is that everyone feels less safe. Children aren’t responsible for resolving a bullying situation, but their opinions about how to proceed should be encouraged and respected. Engaging a child in finding the solution helps them learn problem solving and self-advocacy skills. Featuring information on preventing bullying of students with disabilities. Miami Dolphins alumni Troy Drayton, Lousaka Polite and Twan Russell and cheerleaders Etta, Kristan and Rachael, in partnership with United Way and PACER, hosted a Hometown Huddle at Bob Graham Education Center on Oct. 18. The group hosted a Gatorade Junior Training Camp as the students participated in several fitness-orientated stations and learn the benefits of hydration and staying physically active. Additionally, a UNITY station was added in honor of UNITY day. The kids pledged against bullying and created crafts using positive words. The Dolphins are working closely with PACER’s National Bullying Prevention Center to spread awareness of bullying prevention and to celebrate Unity Day to be united for kindness, acceptance and inclusion. 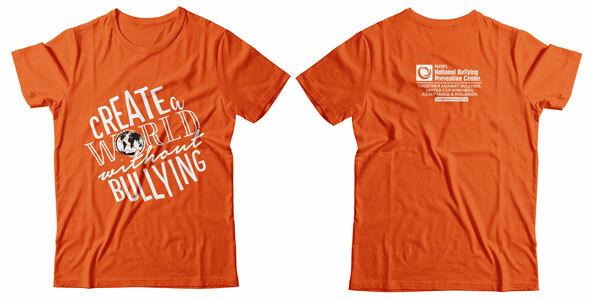 PACER’s National Bullying Prevention Center, which initiated National Bullying Prevention Month and Unity Day, encourages students, parents, teachers, community members, schools and organizations to wear and share orange to support those who experience bullying. LOSERVILLE cast and producers celebrate Unity Day! PACER’s National Bullying Prevention Center (NBPC) is proud to partner with MarVista Entertainment on the newly released Loserville. This captivating teen film follows a high school outcast named Chuck as he navigates the wild and confusing days of his senior year. Chuck’s plan to capture the heart of his dream girl Melissa, by befriending her younger sister Mary, is complicated by the fact that a video of Mary is the talk of the school. Loserville gives an insightful, unique look at teen life and the issues faced by youth. It’s full of poignant, authentic moments, while sensitively tackling and helping the viewer understand the important issue of bullying. On #UnityDay2016, Oct. 19, members of the Loserville team will be promoting Unity Day by sending one loud orange message of support through social media with photos and videos! See all of #TeamLoserville’s #UnityDay video messages. For more information about Loserville, visit www.loservillefilm.com or follow Loserville on Twitter, Facebook and Instagram at @LoservilleFilm. Schairer’s Autumn Acres in Birnamwood, Wisc., is incorporating the Spookley Farm Program into its activities this season. Spookley, a square pumpkin in a round pumpkin world, is the official Spokespumpkin of PACER’s National Bullying Prevention Month. The story is incorporated into the farm’s smaller corn maze for young children, as well as other family activities. Karen Shairer talked about the farm’s bullying prevention efforts on WSAW, the CBS affiliate in Wausau, Wisc. The Spookley Farm Program is part of an educational toolkit created by PACER’s National Bullying Prevention Center to complement The Legend of Spookley the Square Pumpkin by Joe Troiano.